Each year in America, nearly five million men and women are treated with skin cancer, including melanoma – the deadliest type of skin cancer. According to the US National Cancer Institute, the number of American adults diagnosed with melanoma has been growing at a remarkable rate; so much so that the rate of new melanoma cases has tripled from 7.89 per 100,000 population in the 1970s to 22.7 in 2010. Just as shocking is the fact that melanoma death rate for the highest risk group, which is white American males, has increased rapidly from 2.6 deaths per 100,000 men in 1975 to 4.6 in 2011. The CDC has also reported that the rates of new melanoma cases among both men and women have been rising by 1.4 to 1.6 percent per year. Teenagers have also not been spared, with melanoma incidence increasing by 2 percent every year between 1973 and 2009. While the exact causes of this deadly cancer are not known, scientists have established various risk factors for melanoma, including tanning, family history, severe sunburns, UV radiation, number of moles on the person’s skin, freckles, and fair skin. To reduce the incidence of melanoma, people can manage three of these risk factors: severe sunburns, exposure to UV radiation, and indoor tanning. Ultraviolet radiation (UVR) is a human carcinogen. According to the CDC, 61 percent of American adults know that excessive exposure to direct sunlight can cause cancer, and even take measures to protect themselves. In fact, public health surveys suggest that the number of Americans claiming to protect themselves from the sun increased considerably between 2005 and 2010. Within this period, there has also been significant growth of sunscreen product sales, implying that they could be one of the primary ways for people to protect themselves from direct sunlight. Unfortunately, bogus label claims of being “broad-spectrum”, combined with the fact that some only protect from UVB rays (not also UVA rays) could be leaving Americans unprotected in direct sunlight. One study shows that while a good number of American adults employ certain sun protective behaviors, such as using sunscreen, wearing long-sleeved clothing, and staying in the shade, there has not been a corresponding reduction in sunburns among individuals in that age group. Tanning beds emit both UVA and UVB rays. UVA rays penetrate to the dermal-epidermal where melanomas begin, while UVB increase the risk of getting skin cancers, including melanomas. The increased risk of melanoma linked to the use of tanning beds is 59 percent for people who were first exposed to the artificial UV rays before the age of 35 years, and increases with the number of tanning bed sessions each year. Generally, all tan – from direct or artificial UV rays, can cause melanoma. So, if you really want to look tan, perhaps consider using a self-tanning product, but also use sunscreen with SPF 30, since most self-tanners typically don’t offer any sun protection. Dr. Golshani’s line of skincare products, under the brand name Avosant, include a sunscreen with SPF 30 formulated with a moisturizing formula of 17% micronized zinc to provide the highest level of broad-spectrum protection. It’s also chemical and oil-free. Contact our office today @ (310) 274-3481 to purchase. Your hands age just like the rest of your body. Despite being in a prominent place, they are often overlooked and neglected when it comes to skin care. While most of your body parts are well protected from UV radiation, including your face through sunscreen and other SPF lotions, your hands are often left exposed to direct solar radiation which destroys the skin’s elastin, causing sagginess, discoloration, and wrinkles, among other problems. Over exposure to sunlight also causes the skin to lose collagen that keeps it soft and supple. As you get older, the natural fat cushions in your hands also decrease. Since the skin on the back of your hands is very thin, loss of fat padding leaves all structures exposed, including veins, tendons, and bones, giving you the aged, bony look. So, how can you avoid having aged, granny hands? It is estimated that 90 percent of skin wrinkles and discoloration is from the sun. Your hands are just as susceptible to solar damage as your face. Apply a broad-spectrum sunscreen with SPF of around 25 on your hands to protect them from UVA radiation from the sun that causes skin aging. If you are spending a lot of time in sunlight, re-apply the sunscreen every 2 hours. Prolonged exposure to sunlight damages the collagen and elastin in the skin at the back of your hands, and also leads to the development of dark spots. Applying a serum or cream that has antioxidants will help to prevent any damage from UV radiation reaching your skin. Your hands naturally lose fat as you age, which leaves your veins and bones exposed. To reduce the effect, use creams with ingredients like retinol, peptides, and growth factors, which tend to restore collagen in the skin. Besides applying topical creams, you should consider wearing gloves whenever you are gardening, doing housework, and exposed to very cold weather. Gloves also help to protect your nails from damage. This is a vital part of proper skin care as it helps to remove dead skin cells, revealing new skin underneath. The same applies to hand care, to help reduce the rough, dull look of your hands. However, you should be gentle, because the skin is not as thick as that in your body or feet. 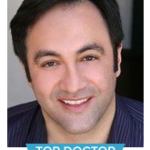 See Dr. Golshani’s 3 Daily Habits for Healthy Skin. Lastly, you should consider switching your beauty and skin care products to natural products. Some of the chemicals used in soaps and other cosmetic products can irritate and inflame the skin at the back of your hands. So, consider switching them to keep your hands looking healthy and youthful, and of course, drink plenty of water. Dr. Golshani offers a handful of skin care products that will help prevent aged-looking hands as they have been studied and thoroughly evaluated by Dr. Golshani himself for ingredients and efficacy. They are recommended to many of his own patients who have reported excellent results. The full list could be found here. It is advisable to drink the required amount of water daily to improve your overall health, since water helps in digestion, absorption, circulation, and excretion. In addition, there are claims that drinking clean water gives you healthy, radiant, and younger-looking complexion. But how much water is needed to impact your skin? The skin is like any other organ in your body, in that it is made of cells: cells that are primarily made up of water. Without enough water, it is unlikely that your organs will function optimally. There are certain instances when your skin does not get sufficient water. This could be due to reduced water intake or over consumption of alcohol or caffeine, causing your other organs to pull water from your blood. As your blood thickens due to water deficiency, it in turn pulls water from the skin cells, causing your skin to look dry, tight, and flaky, and your eyes darker and sunken. When your pores are dehydrated, they are at higher risk of getting bumps, acne, and even blackheads. Dry skin is less resilient and elastic, making it more likely to get wrinkles. Over time, this state can age you faster. However, if you are not feeling thirsty, it is unlikely that you have reached the point of dehydration that thickens your blood and affects your skin. Read Dr. Golshani’s Beautiful Skin Care Tips for Spring. When you drink water, it will reach all your other organs before the skin. This is why it is recommended that you drink a lot of water: 2.2 liters for women and 3 liters for men – spread throughout the day. Drinking more water allows you to expand the moisture potential of your skin, which affects your pores. The pores of hydrated skin are flexible, allowing them to stretch and secrete natural oils. This makes the skin less likely to crack and let in foreign particles that cause irritations. How Soon Will I See the Benefits of Drinking Water to Help Skin? If you start drinking a lot of water today, you should not expect to see changes overnight, but a couple of weeks of drinking sufficient water should be enough to see how hydration helps your skin. It is also important to note that proper hydration simply makes your skin look plumper, minimizing the signs of aging. Technically, the wrinkles on your skin will still be there, but not very visible. Lastly, hydrating your skin by drinking plenty of water should be complemented with topical hydration techniques, like the application of moisturizers. Hydrating your skin both internally and externally is critical for a healthy, beautiful skin. If you’re looking for topical recommendations, then please refer to my very own personal line of skincare products I developed in response to my own patients being unsatisfied after the use of multiple other products. Dr. Golshani’s Spring Skin Care Tips for Beautiful Skin! Spring is a season where you shake off the symbolic layers of winter and prepare to bloom. The changes in weather can inflict damage to your skin, which is why the beginning of spring is a great time to reassess your skin care regime. Incorporating new beauty care products to your new skin needs is important in order to effectively deal with the change in climate, sunshine, high humidity, and exposure to environmental factors as you will be spending more time outdoor, whilst enhancing your beauty for the season. After the cold, dry winter days are over, your dead, dry, and flaky skin remains. So, it is important to get some deep exfoliation and cleansing. Most of your body is covered up during winter, with long sleeves, long pants, warm socks, and boots, so you rarely get to examine your feet, elbows, and knees. Get rid of the old dry skin layer to make room for fresh dazzling spring skin. Interested in upgrading your collection of skin care products? Try one of Dr. Golshani’s scientifically-tested skin care treatments. We have a variety of different products to choose from – essentially a one-stop shop. Check it out! The sun can get very strong at this time of the year, so it is important that you always carry a day cream with SPF to protect yourself from harmful UV radiation from the sun, which may cause, among other things, premature aging and sunburns. Supplements contain vital antioxidants that help protect your skin from free radicals found in food and the polluted environment. These radicals damage your skin, and over time, destroy collagen contributing to more wrinkles and aging. Eating plenty of fruits and vegetables, as well as other sources of vitamins C, E, and K will help to improve your skin’s elasticity and prevent it from getting dry and flaky. Lastly, hydrate your skin. Winter weather and over-reliance on central heating can cause your skin to feel tight and flaky. This can be remedies by increasing your hydration levels by drinking more water and using a moisturizer that contains humectants like omega oils and hyaluronic acid. Taking omega 3 supplements will also help to increase your skin hydration levels, removing the flaky post-winter look and restoring its barrier function.